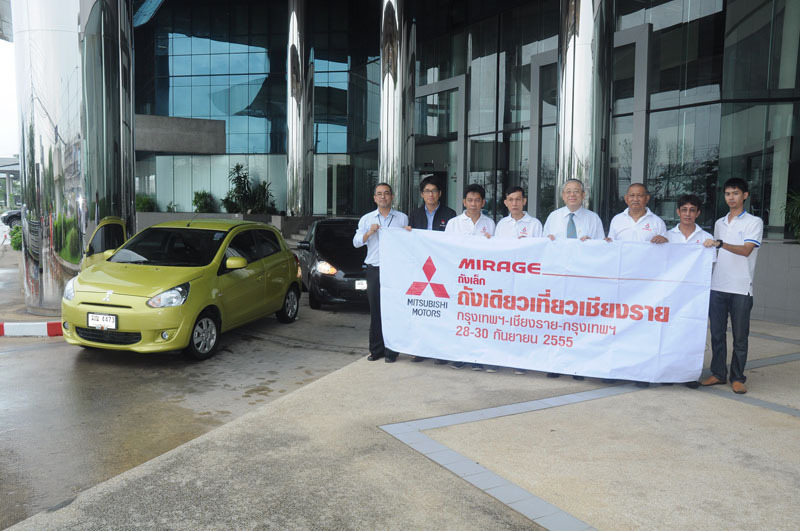 Last September, Mitsubishi Thailand sponsored an economy run using multiple teams of media reps (writers/reviewers) driving a pair of Mirages round-trip from Bangkok to Chiang Rai and back again. tire pressure set to 45 PSI (owing to poor road conditions, if I got the translation right). 35 PSI is normal spec. Nice. And as I suspected, the manual is a little better on an economy run. The elevation change on the route took them from sea level at the start, to ~2k ft / 610 m elevation in the north, and then back to sea level. That would have had the engines running closer to peak efficiency on the way up, and they possibly had lots of opportunities to coast on the way home. I wonder about the taping of the hood, why not do something under the hood with some sort of insulating rubber like used around widows and doors in a home to stop air leaks. I would think that would come close to doing the same thing and you wouldnt have to remove it like you do tape. Plus looking at the car it would still look like it was factory. Has anyone tried that? i am hoping to get my Mirage this week, a base 2015 DE with the 5 speed. Some cars (Mercedes comes to mind, but others are doing it now) make a lot of effort sealing the hood gaps with gasket material, as well as the gaps around the headlights, grille and bumper. It's only going to make a tiny difference to overall efficiency, but the idea is every little bit helps.